Huawei has today announced the latest high-end model of its sub-brand Honor. 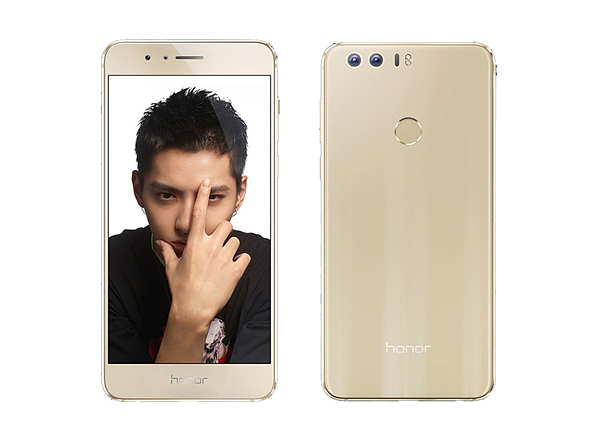 The Honor 8 is in many ways a smaller version of the phablet-device Honor V8 and also has a lot in common with Huawei’s current flagship P9. Like the P9, it comes with a 5.2-inch 1080p IPS display and a dual-camera setup. The main imaging module combines the images of two 12MP sensors with F2.2 aperture but has to make to without the P9’s Leica Summarit branding. In terms of memory the device offers up to 4GB of RAM and 64GB of expandable storage. Android 6 and Huawei’s EMUI 4.1 are powered by the Chinese manufacturer’s in-house chipset Kirin 950 and like on the P9 there is a fingerprint sensor on the back for increased security. The 3,000 mAh battery is charged via a USB Type-C port. The Honor will become available in China on July 19th. The base model with 3GB of RAM and 32GB of storage will cost approximately $298, the top-end version with 4GB RAM and 64GB storage will set you back approximately $335. No information on international availability has been revealed yet but it can be assumed the Honor 8 will be available to purchase in other regions soon.